Nobody gets joy out of being marketed to or being a ‘Marketer’. Nobody believes that marketing is going to change lives. Yet, imagine if you were an Inspirer…or an Educator… or a Delighter!? 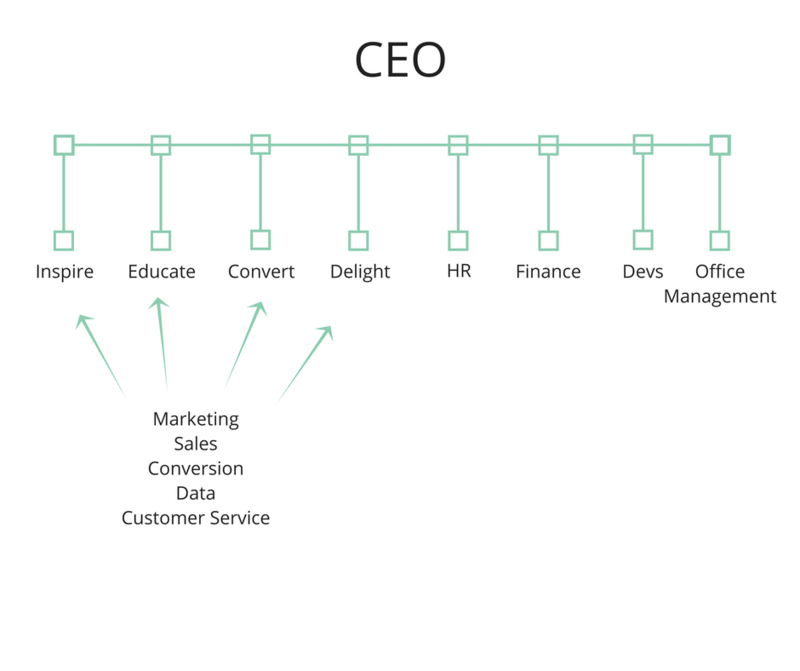 If I had a company I would have an ‘Inspiration team’ an ‘Education team’, a ‘Conversion team’ (that one already exists) and a ‘Delighter team.’ A team for each stage of the online journey (aka the digital marketing funnel). The teams would be a mix of content creators, social media listeners, customer engagers, paid advertisers and digital analysts. They would be a combination of marketing, customer service, sales, user experience and data and each team would own each stage of the online funnel. Whether their job is to attract, educate, convert or delight they would be nearly self-sufficient teams, each with their one clear objective. The traditional departments of a business are no longer relevant in today’s digital world. For businesses to be a success they don’t need to ‘market’ themselves or ‘sell’ themselves; they need to entertain, inspire, educate, delight, get attention, tell stories and create user-friendly experiences online. If social media is the new word of mouth then how can any client facing team expect to be truly effective or successful without being empowered to inspire, educate, delight, tell stories, publish and engage with users online. The traditional departments of a business just create barriers between a business and online success – the barrier between the Marketing and Customer Service team being the biggest. The Customer Service team – the people who know how to use the product, the people who speak to the customers every day often have no input or influence on a business’ voice. The business’ voice lies with the Marketing department. The Marketing department – expected to attract new customers, increase customer retention and create content that resonates without ever speaking to the customer. Marketing is dead. Time to get rid of your ‘Marketing’ department. Here’s to Inspiring, Educating, Converting and Delighting!